Happy 1st of August to everyone ! Today is the Swiss national day, commemorating the Rütlischwur that marks the birth of the Swiss nation. To join in the fun, I have new socks. These colours are admittedly nothing like the Swiss national flag. 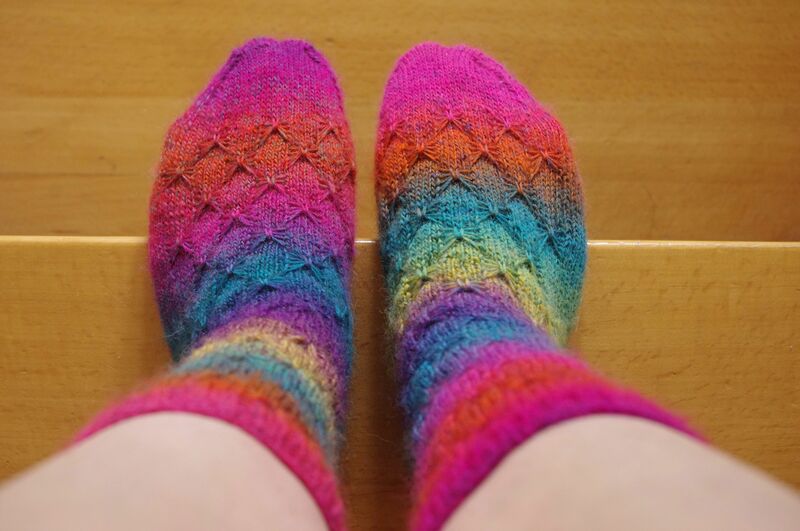 They are Flutter-by Socks (Ravelry link) and the yarn is Rico Superba Poems, in the colourway Candy. The pair took about two thirds of one ball. The pattern is fun and easy, but was maybe not the best match with this yarn — the butterflies are a bit lost in that riot of wild colours. 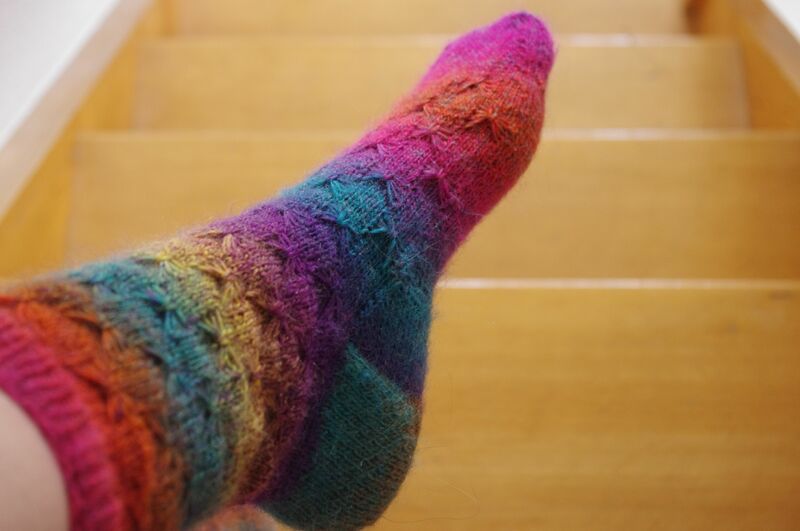 To avoid disturbing the colour transition on the instep, I simply knit the heel from the other end of the ball, and broke it (the other end, not the heel) when it was time to pick up gusset stitches. Anyway, I’m quite smitten with them. As the temperature was rather chilly, I wore them yesterday evening, hot off the needles, to the traditional 1st of August (or rather July 31st) fireworks, whose bright colours they matched perfectly. On that occasion, I became one of those eccentric ladies who wear woolen sock with sandals because they can’t stop admiring their own feet. (I had forgotten to take into account the fact that at 10:30 pm, it would be dark outside anyway. But that didn’t stop me from trying to show them off to the friends we met on the way). 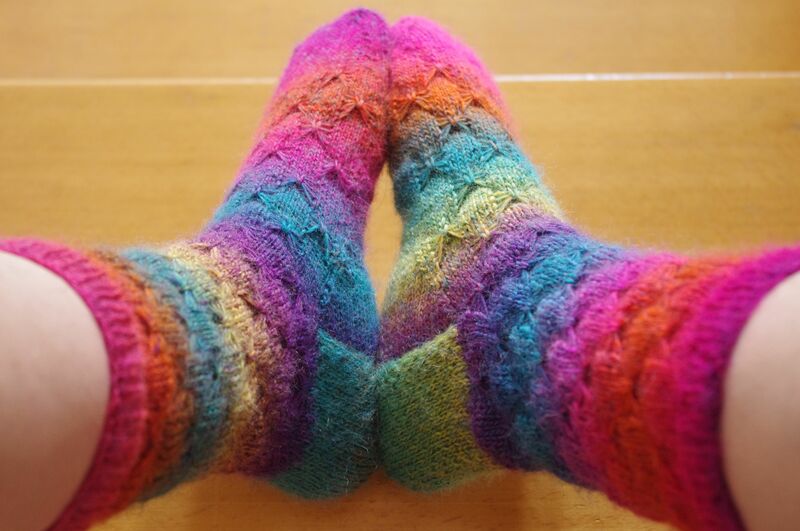 These socks drew some comments when I knit on them in the train to and from the university. The general feeling seemed to be that these vibrant shades made people feeling better in spite of the terrible weather we had these past few days weeks. I agree. Fireworks socks. I really feel as if I could rocket to the roof when I wear them ! Simply looking at them makes me giggle. I must really be getting weird. Nobody had warned me that socks had such an effect on your brain !